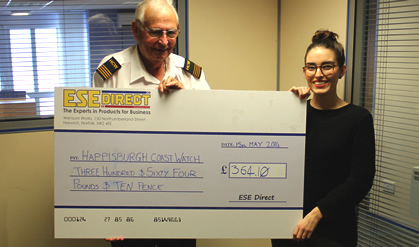 Happisburgh Coast Watch won our April Charity Day with over 80% of the votes. Following their hard fought victory, chairman and station manager Fred told us a bit more about the charity when he came in to collect the cheque. The charity has been running for 24 years and it surveys a stretch of the Norfolk coast, monitoring ships and anything that passes and logging it into their system. This vital information provides great assistance to the coast guard who are greatly helped by the efforts of the Happisburgh Coast Watch. The charity take home £364.10 from the ESE Charity Day, Fred has advised that it is a tremendous help, the charity needs around £2,200 a year to survive so this will tide them over for around 3-4 months. The money will go towards the general upkeep of the premises, as well as broadband costs (so that it can be monitored around the clock as well as allowing the Happisburgh coast guard access to the log) and replacing equipment. They are also in the process of moving offices and setting up a website which allow people to donate online. We let you know the website once its live. Thanks to everyone out there who voted, and keep an eye out for our next charity vote at the end of the Month.